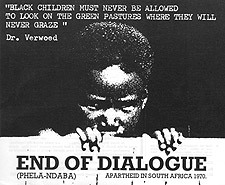 END OF THE DIALOGUE is a landmark film that was one of the first to reveal the full horrors of apartheid to the world. Made in 1970, the film is valuable not only as a record of apartheid, but as a record of how people's understanding of South Africa was then changing. Produced by a small group of black South African exiles and film students based in London, it caused an uproar when it was originally released. More than 30 years after the images and facts still shock. At that time, white South Africans enjoyed the world's second highest standard of living, while in some parts of the country black life expectancy was 34 years, with 50 percent of black children dying before their fifth birthday. 87 percent of the country's land was reserved for whites, with the least desirable tracts set aside for black self-sufficiency. The film features stark visual contrasts between the prep schools, military parades and rugby matches of the white minority, and the bare classrooms, torn clothes and back-breaking working conditions of the blacks who make their lives of luxury possible. A powerful contemporaneous record of the apartheid years, watching END OF THE DIALOGUE today, one can't help but be struck by how remarkable South Africa's transition to democracy has been. Shot secretly and smuggled out of South Africa at the height of the apartheid era, this was the most widely screened and influential anti-apartheid documentary. Now restored and on DVD for the first time. The trial of the "Upington 25" in South Africa in 1986 saw twenty-five men and women from a black township tried for the murder of a local black policeman.